If you have a garden you're bound to throw a few parties during the summer. Whether it's a huge expanse of lawn or a run-down looking piece of concrete behind the house there's nothing like a bit of sun to get everyone outside for a knees-up. You don't need much space to host a summer party and the perfect accompaniment to a few decent tunes and a couple of cocktails, is a barbecue. Even the most reticent of cooks will enjoy throwing a few steaks or chicken wings on the barbie and it's not too difficult to perfect the art of cooking over coals. You won't need to splash out the cash on expensive equipment either; you can pick up a fairly decent barbecue for no more than the price of a round of drinks. Unless you're planning on eating al fresco well into the winter months, there's no point in spending a fortune on a barbecue anyway. There's also the disposable option - these are great if you're planning on cooking dinner down on the beach but not really that practical for everyday use. You'll also need to invest in some tongs unless you want to singe your fingers every time you have to turn a sausage but again, these are pretty cheap. Other than that there's no real essential equipment, as such, and you should be able to make do with what you've already got in the kitchen. Light the coals about 30 minutes before you want to start cooking. The coals need to be red before they're hot enough to cook food. Barbecues can be notorious occasions for getting food poisoning and this is because it's almost impossible to gauge the temperature and it's difficult to maintain the heat enough to cook food evenly. Avoid this by ensuring that it's hot enough before you begin. Chicken can be started off in the oven and finished on the barbecue, to ensure it's cooked through properly. 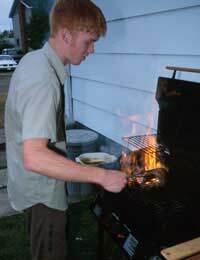 If there are vegetarians at the barbecue, keep one side of the grill free of meat. Marinate meat for a few hours before barbecuing and then baste with the marinade during cooking. Don't serve the marinade with the cooked meat, as it will contain juices from the raw meat. Spuds are a great accompaniment to serve at a barbecue as they can sit happily in the oven until the meat is cooked. As this inevitably takes longer than planned, this is a good thing! Boil these in a large pan until the kernels are cooked and tender. For a smoky taste finish them off on the grill for a couple of minutes. This can be prepared in advance and whisked out at the last minute. Combine the cooked, drained and cooled pasta with chopped spring onion, red pepper and crumbled feta cheese. You can also cook fish and seafood on the barbecue. Fish is best wrapped in foil so it doesn't break apart. Add some slices of garlic, ginger or lemon for extra flavour. Prawns are best cooked on skewers and can be marinated in some olive oil and chopped chilli beforehand for a bit of a kick. In fact, so much can be cooked on a barbecue that it's just a shame the weather means you can't get the coals burning every night of the year!